So my daughter read me her journal and I immediately took a picture. It sure is one I don't want to forget. Her words of wisdom are so present that this mom is grinning from ear to ear and very proud. I keep praying God would continue to give my daughter boldness to share her faith. 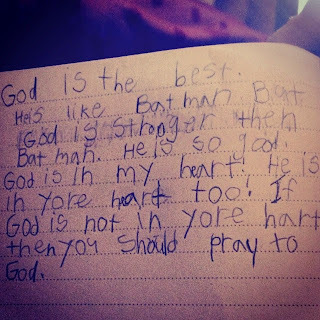 In the words of my sweet 7 year old, "God is stronger then Batman...If God is not in your heart then you should pray to God." Yes, you need HIM! The one true king, the maker of heaven and earth! He loves you and is waiting for you to talk to him!